As I stated above, this is going to take some time. It will likely take the most time of this entire process. But bear with me. If you are installing a lot of servers (this process I am covering can be fully adapted for production install too) this will save you time in the long run. Next click on “Begin with a template”. This will load a very generic template that you can modify for your needs. 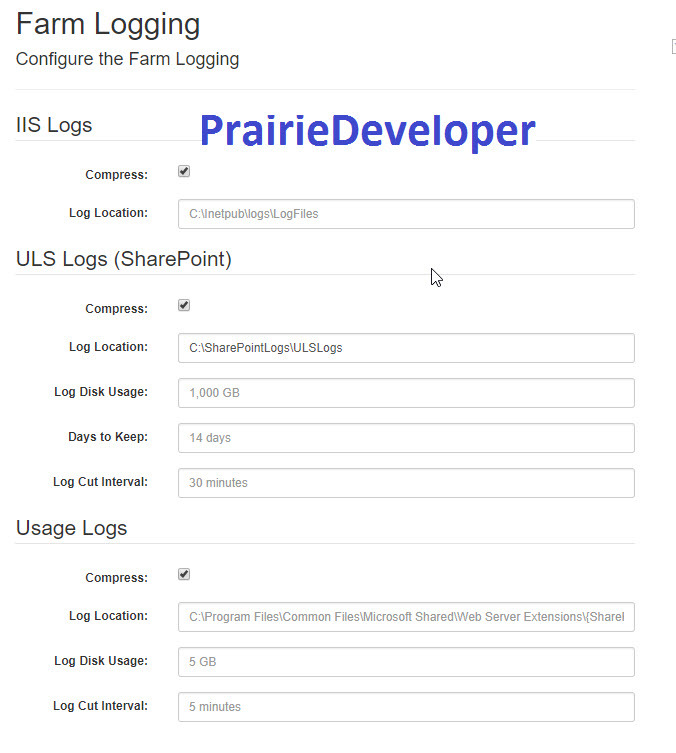 Next enter the host names of the SharePoint servers in your farm. If you are only building a single server farm you should not enter anything here. You will receive an error. Click on Install along the Navigation menu (left side) to move onto the next step. Offline Install: Indicate if you have already prepared the files required for install. Since we did this in the previous post, we will place check here. Pause After Install: This will stop the script from continuing while the other servers have their binaries installed. Check this if you are installing multiple servers at the same time. In this case, we are going to NOT check it because we are going to enable the next option. Remote Install: Selecting this will allow the script to install SharePoint on all of the servers you entered in the Host Name section. Ensure you setup your servers for remote installation (steps in the previous post). Parallel Install: Only enable this if your servers aren’t hosted together. For the sake of this post we will not be selecting it as the slow down caused by multiple installs on the same hard drive will be worse than waiting for the two servers to complete in sequence. Auto Logon: Check this option, but do not fill in the password (you will be prompted during the install). This allows the script to login on your behalf for any reboots. Don’t make any changes to the options in the Disable Components section. Config File: Enter the name of the config file. It will be created by AutoSPInstaller and automatically prepped in the script. Install Directory: Location where SharePoint should be installed to. Make sure the location exists for all servers. Data Directory: Where data components (like search index) are stored. Make sure the location exists for all servers. Pid Key: The license key for the install. Farm Passphrase: Enter the passphrase needed to join servers to the farm. Leave the admin checkmarks as they are (we want it as admin for the configuration, but don’t want to leave it there). Make sure the Create Alias option is checked and enter your alias name. Database Server Instance: The instance you built when you created your SQL Server. Database Server Port: Port your instance is running on. 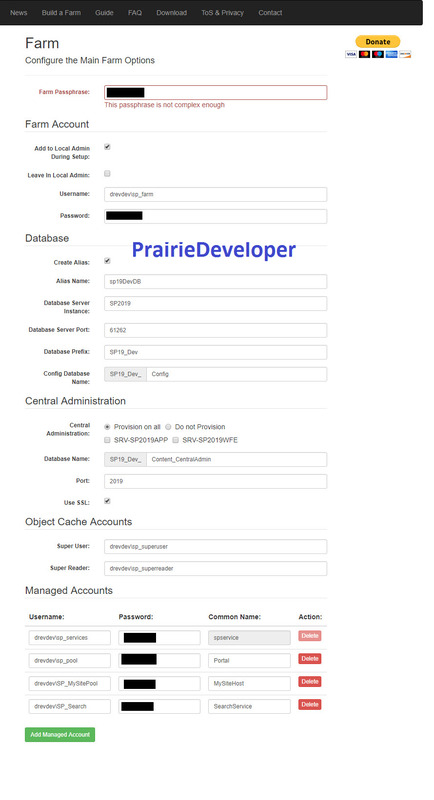 Database Prefix: As it reads, how you would like the databases prefixed for databases in this server. You can leave it blank, but it makes it easier if your server is shared. Central Administration: I would suggest you provision on both. I have actually had a server’s CA connection break and had to flip over to the other server to configure the farm. You can change the port if you want, but if it is a dev environment you can just leave it the same. Finally, enter your cache and managed accounts as well as the passwords. Set all options on this page to “Do not Provision”. You can actually leave it the way it is because we are setting the next screen up as a MinRole and it overrides the settings on this page. I just choose to disable to be on the safe side. Make sure you are compressing your logs (three checkmarks). The only item I would suggest changing is the ULS Log locations. I would leave everything else as default for a DEV environment. AutoSPInstaller builds out two web applications for you by default. 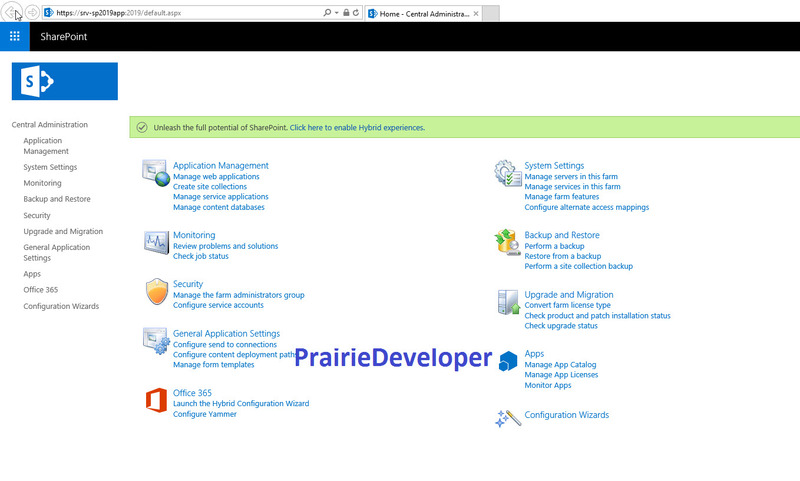 The Portal (your main SharePoint site) and MySite Host. One thing to note. I don’t intend to use Host Named Site Collections off of my Portal web application, but I am still going to leave the host header option blank. You never know what can happen. 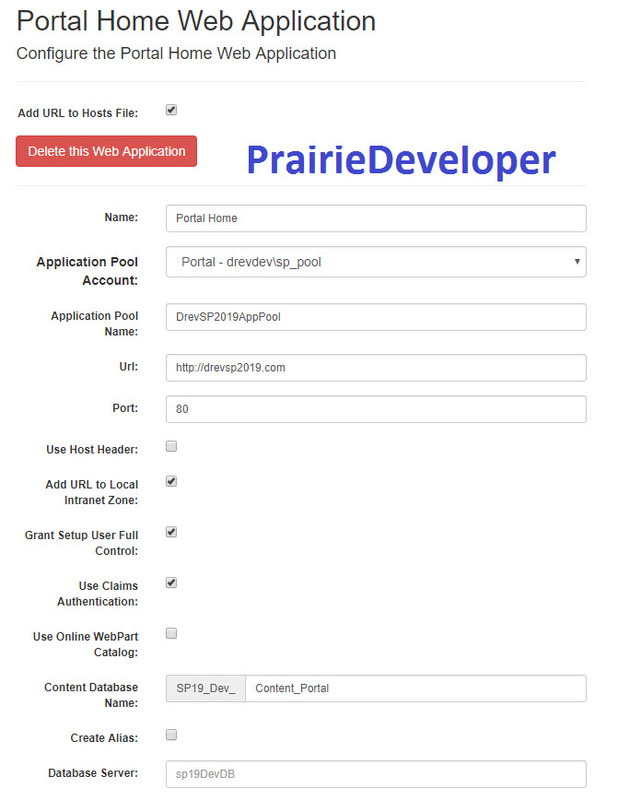 You will find the application pool is already selected for you. You can change some of the default settings (I recommend you at least change the App Pool Name and URL). You can also set up any managed paths here you wish. I am going to be adding a path for application development and search right now (sites are created for you automatically). AutoSPInstaller creates a single site collection by default for you. 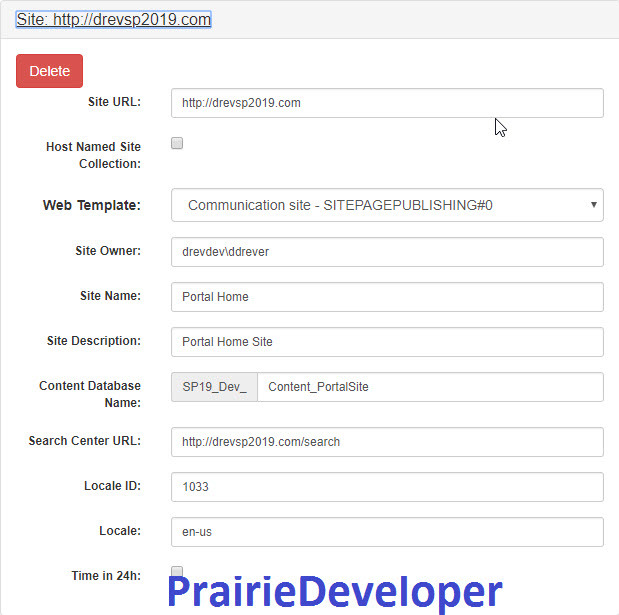 I modified this one to the root URL I created for the web application, added my username as the owner, modified the searc centre URL and provided a name for the content database. I created one more site collection to be used for the search centre. The MySite Web Application I left pretty much default except modified the URLs (web app and site collection) and AppPool name. 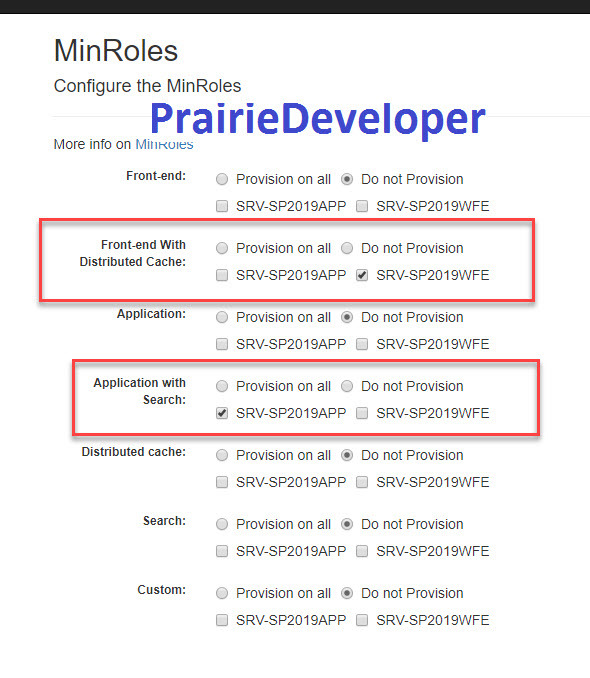 Because we are deploying MinRole servers for this installation we can ignore setting specific servers to run the service apps on. We’ll just concentrate on the options for each. My Site Managed Path should point at the wildcard path you added to your MySite Web App. Enter your contact information for messages in the search service. If search functionality fails the system will email you. If you don’t want to use the default location for your index update it in the Custom Index Location field. Proxy Type: for a dev environment I recommend Reduced. You really don’t need a lot of threads running for search in a dev environment. Enter the crawl account name and password. Make sure you don’t use the same account running the service. Use an account specifically for crawling data. You can modify the rest of the options, but for my dev environment, I left the rest at the default. In the past, I have deployed this service, but I haven’t worked on a BCS solution in quite some time so I advise to leave it for now and deploy it later if you need it. I left most of this default, except modified the URL to match the domain I was using. You can choose to deploy these services if you are planning on using them, but for the purpose of this environment, I won’t be. I won’t be installing Project Server at this time. We’ll leave that for another post. I recommend that it doesn’t get installed at this point. If something goes wrong with the installation and you installed them both at the same time, determining the cause might be more difficult. 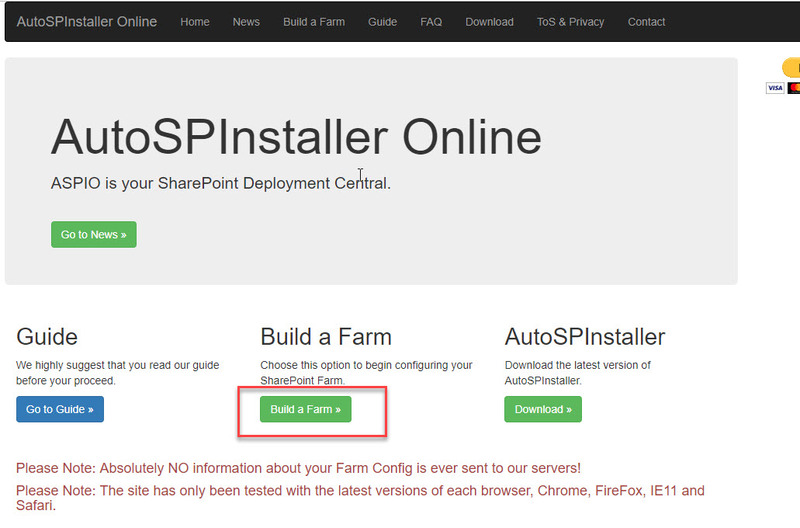 However, installing SharePoint and ensuring it is working before Project Server could make any troubleshooting easier. The AutoSPInstaller site doesn’t have a save file functionality. 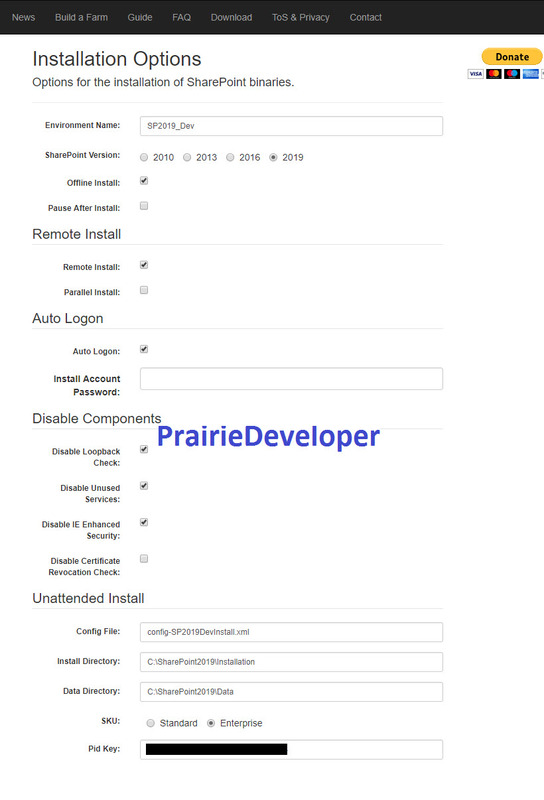 Just click on the Review and Download link and copy the data from the text box into a text editor app and save the file as an AutoSPInstaller config file (AutoSPInstallerInput-SRV-SP2019APP.xml). Next, we move on to the actual install. ac -Encoding UTF8 C:\Windows\system32\drivers\etc\hosts "192.168.0.125 drevsp2019.com" ac -Encoding UTF8 C:\Windows\system32\drivers\etc\hosts "192.168.0.125 mysites.drevsp2019.com"
ac -Encoding UTF8 C:\Windows\system32\drivers\etc\hosts "192.168.0.125 drevsp2019.com"
ac -Encoding UTF8 C:\Windows\system32\drivers\etc\hosts "192.168.0.125 mysites.drevsp2019.com"